Our Model PFC8 Portable Fume collector featured here is an 800 CFM fully portable base unit with a 6″ x 10′ Z-Max fume arm with hood standard. 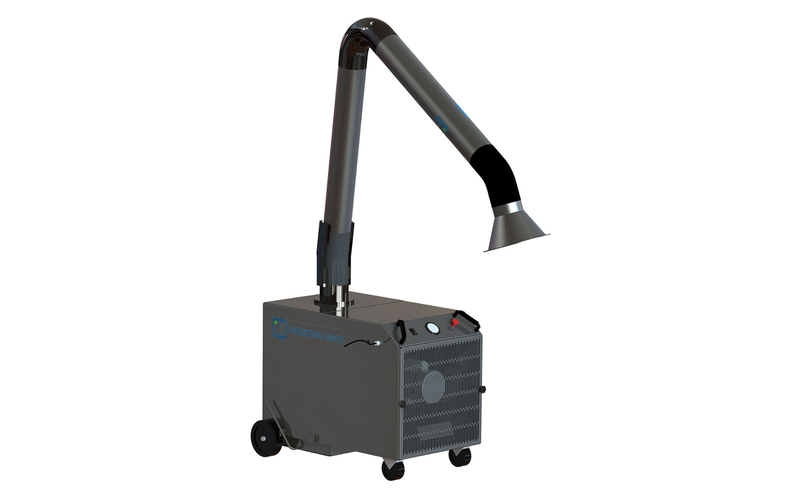 An optional upgrade to an 8″ diameter fume arm increases CFM to 1000. 12 & 14 powder-coated steel construction with on/off switch & 20′ cord. 5″ swivel casters with brakes on front, 10″ rear wheels. External dust tray. The motor is a 1 HP direct drive high efficiency motor with manual thermal overload mated with high efficiency direct drive non-sparking composite BI wheel. 250 sf flame retardant 80/20 cell poly cartridge filter. Tool-less filter service and maintenance.